When you visit Washington, D.C. and want to grab a meal away from the hustle-and-bustle of the tourist hot-spots, locals will point you in the direction of Adams Morgan. Adams Morgan is a late-night locale recently dubbed Eater DC’s 2018 Dining Neighborhood of the Year. The eclectic neighborhood provides a diverse cultural assortment of eateries and a variety of restaurant types. Besides its growth as a locals’ go-to for dining, restaurants in Adams Morgan are gaining national recognition with notable award wins and nominations. Five of the best places to eat in Adams Morgan are listed below. 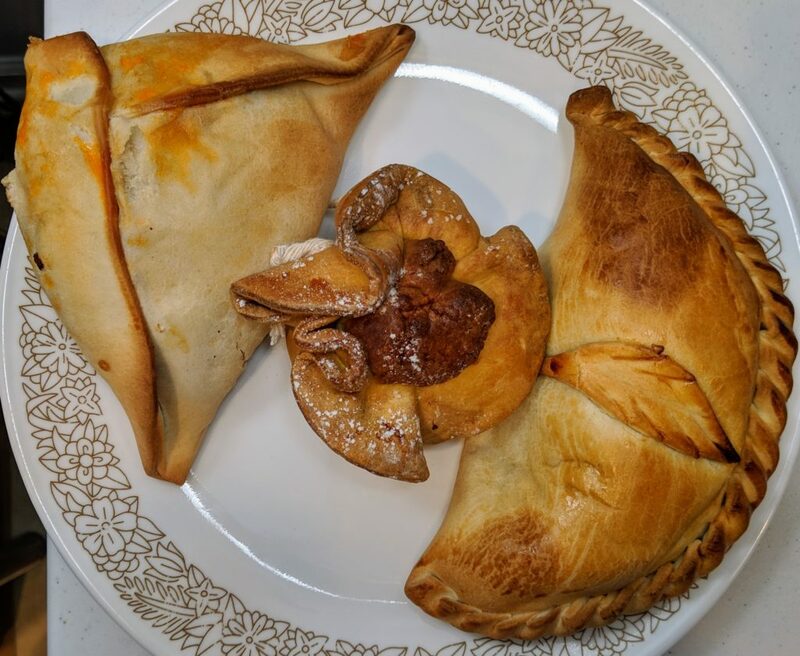 Julia’s Empanadas is a quintessential on-the-go grub grab. The cafe looks like a small, streetside bakery, but instead of cakes and pastries, the counter overflows with steaming, stuffed, and massive empanadas. Patrons can choose savory meat, flavorful vegetable, or sweet fruit fillings. Julia’s is open all night, making this a popular late-night stop for Adams Morgan’s nightlife crowd and a plausible addition to D.C.’s Best Late Night Eats. 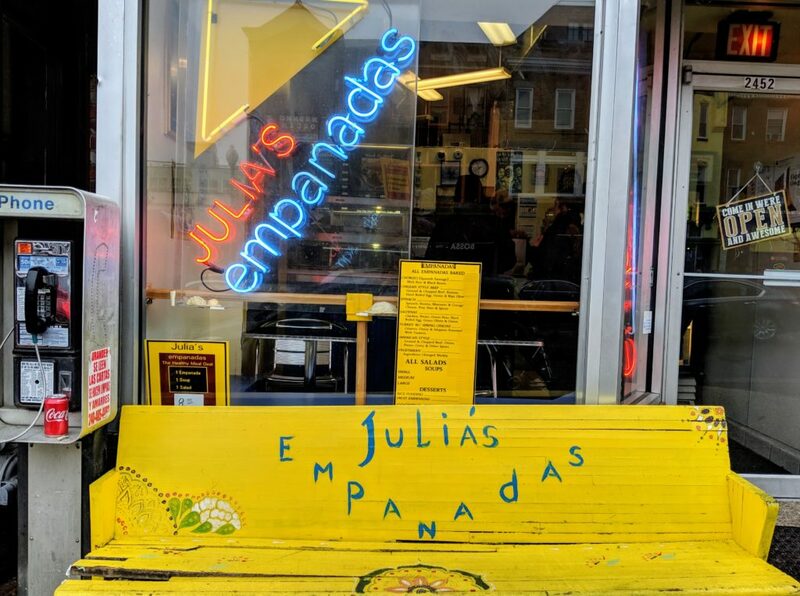 If you go: Julia’s Empanadas is located at 2452 18th St NW. It opens daily at 11:00 am. It closes at midnight Monday through Wednesday, 2:00 am on Thursday, 4:00 am on Friday and Saturday, and at 8:00 pm on Sunday. Donburi embraces Japanese minimalism and simplicity. Diners sit on stools at a counter in view of the stoves and prep kitchen. The restaurant is clean and undecorated, with a menu is as minimal as the decor — only rice bowls and curries. The chefs create the dishes quickly and efficiently, making it a good choice for a quick and casual lunch. Expect a meal from Donburi to be filling, affordable, and delicious. If you go:Donburi is located at 2438 18th St NW. It is open daily from 11:00 am to 10:00 pm. Lapis is a family-owned and operated Afghan restaurant that made the 2019 Michelin Bib Gourmand list. Here, family-style eating is encouraged, with dishes that can be separated and shared. 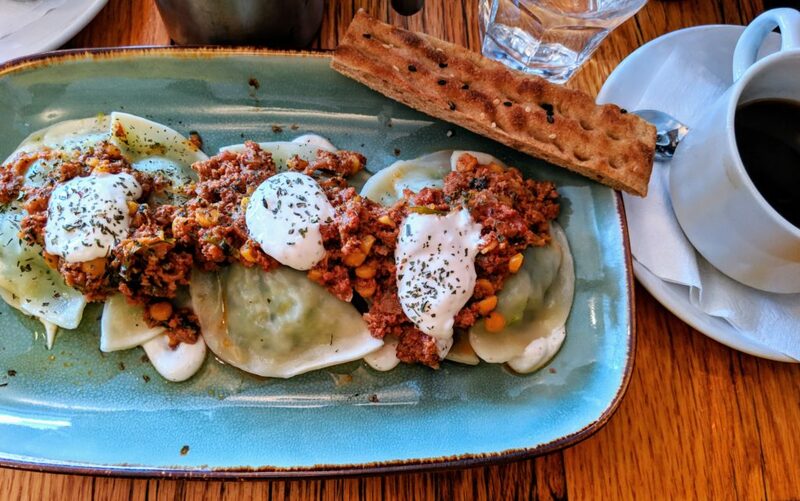 A weekend brunch has American brunch staples, seasoned and cooked with an Afghani twist, alongside traditional Afghan breakfast options. At dinner, expect to explore a unique and flavorful cuisine with your cardamom cocktail. If you go:Lapis is located at 1847 Columbia Road NW. It opens daily for dinner at 5:30 pm, closing at 10:00 pm Sunday through Thursday and at 11:00 pm on Friday and Saturday. Weekend brunch is available Saturday and Sunday from 10:00 am to 3:00 pm. Smoke & Barrel is a casual two-story nook that can appease a large group of friends with diverse eating habits. The establishment has varied drink options: choose from craft beers, traditional cocktails, and high-end whiskeys. The menu includes barbeque favorites for meat lovers and vegetarian and vegan fare for plant-based eaters. If you go:Smoke & Barrel is located at 2471 18th Street, NW. It opens daily for dinner at 5:00 pm, closing at 11:00 pm Sunday through Thursday and at 12:00 am on Friday and Saturday. Weekend brunch is available Saturday and Sunday from 11:00 am to 3:00 pm. Brothers and Sisters is situated inside the hotel lobby. Hosts seat diners at traditional tables or on lobby sofas. The menu offerings are contemporary and creative, sometimes combining comfort foods with an unexpected flavor. 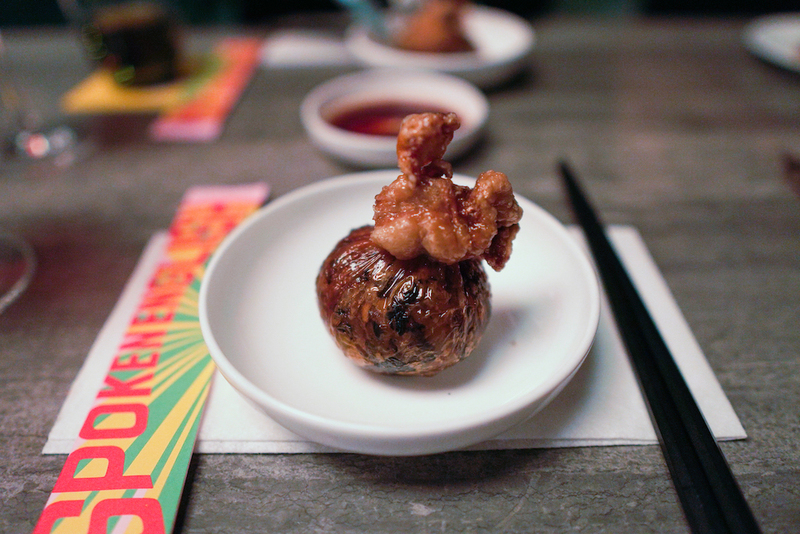 It is perhaps the only place in D.C. serving octopus hushpuppies and seaweed french fries. Downstairs is a basement kitchen that doubles as the Spoken English restaurant. The restaurant defies sit-and-eat conventions. Its 16-person standing-room-only capacity provides an intimate and unique dining experience. Expect conversations with table neighbors and chefs, a full view of the cooking and food preparation, and Asian fusion eats. Established in 2018, Spoken English is skyrocketing in popularity and garnering national attention, including being named a 2019 James Beard Foundation semifinalist for Best New Restaurant. For a fine dining event, head upstairs to A Rake’s Progress. High, domed ceilings and perfectly manicured tables complement the upscale atmosphere. Spike Gjerde, the restaurant’s award-winning chef, highlights farm-to-table fare that is local to the Mid-Atlantic region. Available entrees are singular or sharable and primarily focus on game animals and fish. If you go: The Line Hotel is located at 1770 Euclid St NW. Brothers and Sisters is open daily, from 6:30 am to 10:30 am for breakfast, from 11:30 am to 12:00 am for lunch and dinner, and from 4:00 pm to 5:30 pm for afternoon tea. Spoken English is open from 6:00 pm to 12:00 am Tuesday through Saturday. A Rake’s Progress opens for dinner from 5:00 pm to 9:00 pm on Sunday, 6:00 pm to 11:00 pm Monday through Thursday, and from 6:00 pm to 12:00 am on Friday and Saturday. Weekend brunch is available Saturday from 11:00 am to 2:30 pm and Sunday from 11:00 am to 3:00 pm. Steph Ligouri lives in Washington, D.C. and is passionate about traveling and eating. She hopes that written experiences on diaryofatravelingeatie.com inspire your wanderings near and far and convince you to pursue eclectic consumption.